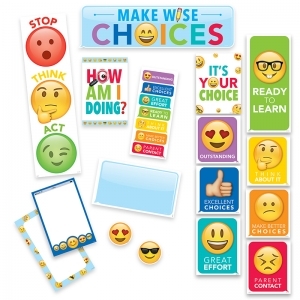 This Emoji Fun Behavior Clip Chart mini bulletin board is a versatile whole-class behavior management tool that features easily identifiable emoji faces and icons. 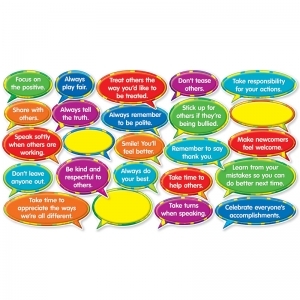 This chart will help students keep track of their behavior throughout the day and develop personal accountability for their choices. 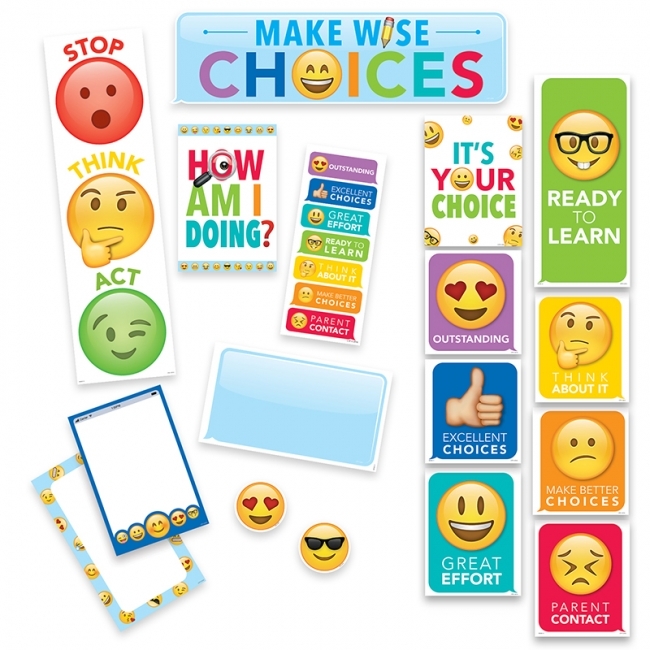 This colorful and unique 22-piece set contains 9 pre-printed behavior clip chart pieces, 1 customizable blank behavior clip chart piece, 2 blank labels, 6 desktop behavior clip charts, a "Make Wise Choices" header sign, a "Stop, Think, Act" sign, and 2 emoji face accents. 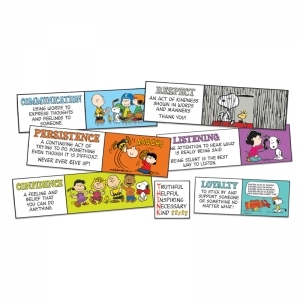 Behavior chart includes a different color to indicate each level of behavior management. The emoji faces make this chart perfect for non-readers and non-English speaking students (ESL/ELL). Assembled chart measures 6" x 63". Tip: This set is flexible to your classroom management style! 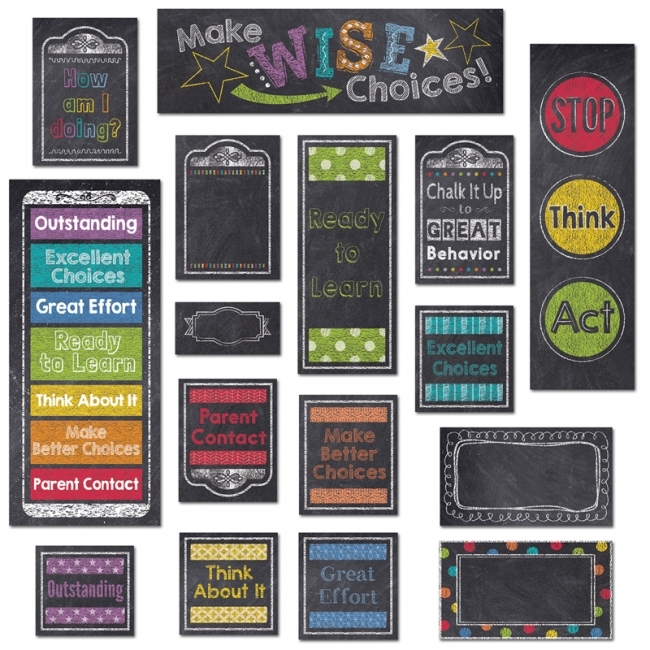 Based on the needs of your class, you may wish to limit the number of choices you display or you may use the additional blank behavior chart pieces to create additional/different behavior categories. 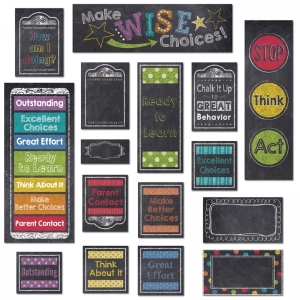 This mini bulletin board set also includes an instructional guide with display ideas and classroom lesson activities. Help students keep track of their behavior throughout the day and develop personal accountability for their choices with this whole class management tool. 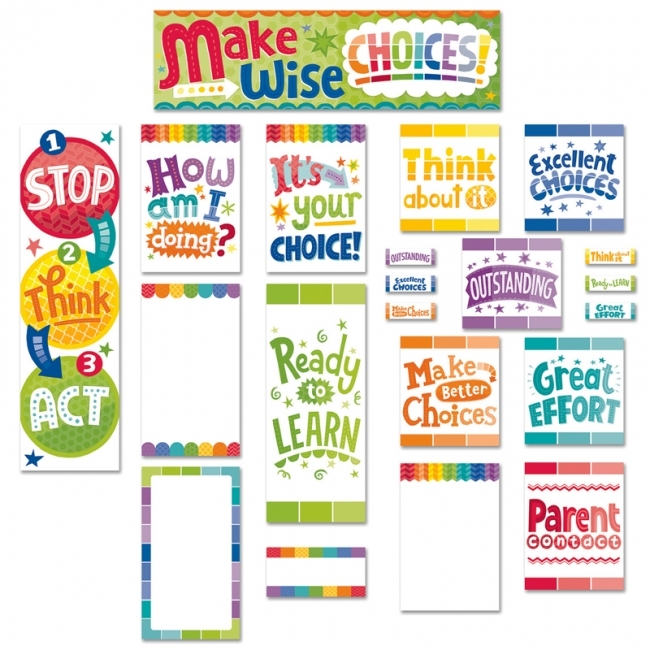 This eye-catching 21-piece set contains 9 pre-printed behavior chart pieces, 1 customizable blank chart piece, 3 blank labels, 6 desktop behavior clip charts, and 2 motivational messages. Assembled chart measures 6 x 63 inches. Help students keep track of their behavior throughout the day and develop personal accountability for their choices with this whole class management tool. 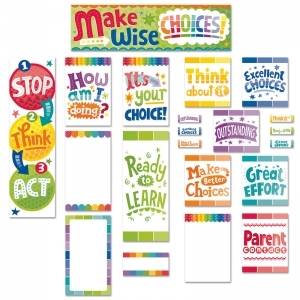 This eye-catching 21-piece set contains 9 pre-printed behavior clip chart pieces, 1 customizable blank behavior clip chart piece, 3 blank labels, 6 desktop behavior clip charts, and 2 motivational messages. Assembled chart measures 6 x 63 inches. 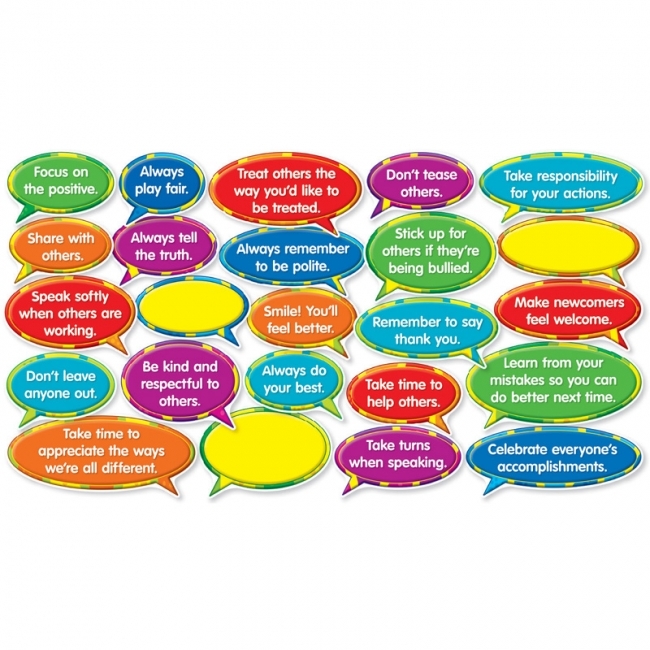 Help students be the best they can be with these 21 colorful speech bubbles emphasizing good character. 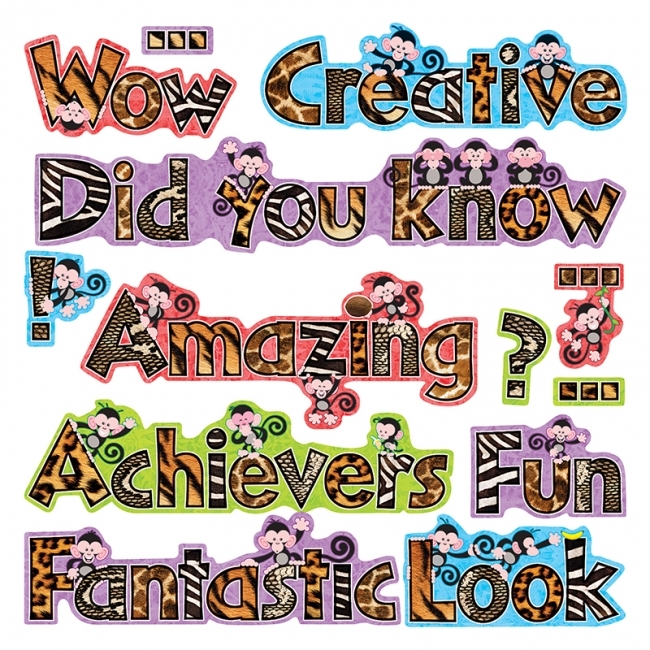 Cutout words and phrases featuring smiling monkeys and animal print letters. Includes: What We Did, What's Up?, Wow, Did You Know, Look, Amazing, Achievers, and more. 32 pieces, up to 22". 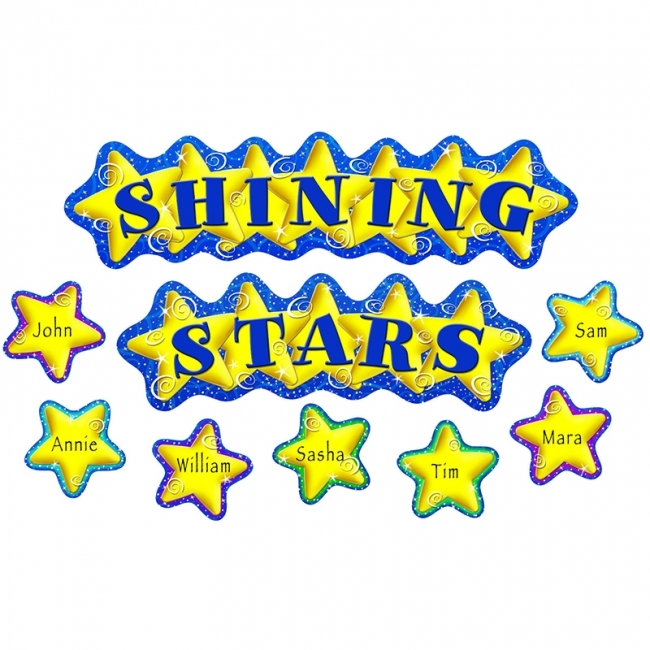 Use this display to make students shine! 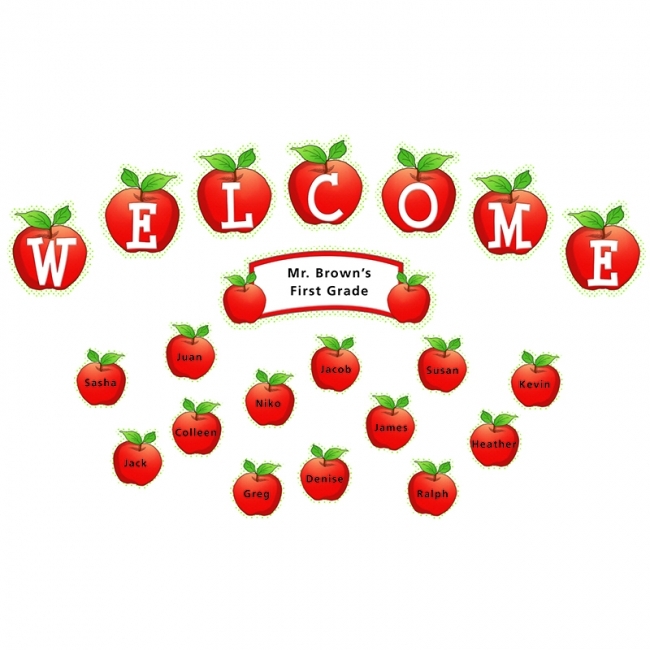 The 4-page teacher's guide suggests a wide variety of uses including recognizing birthdays, attendance, good behavior, and classroom responsibilities. 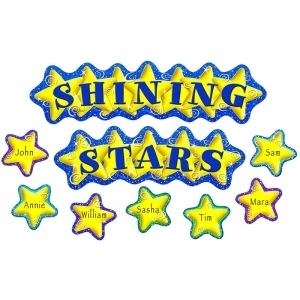 Includes 39 pieces, including 37 stars. Largest piece measures 20" x 5-3/8". Shiny, protective coating adds durability. Make students feel welcome by writing their names on the apples in this display! The 4-page teacher's guide suggests additional uses, too. "Welcome" apples are 6" x 5.5" each. Includes 38 pieces, including 30 apples. Shiny, protective coating adds durability.